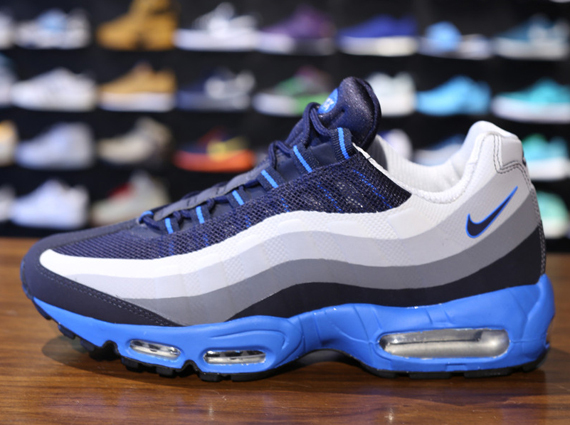 One of Nike Sportswear's many reiterations of the Air Max 95 is on its way to retailers. Nike Sportswear's recreated runner sports a one-piece 'No-Sew' upper over a classic Air Max 95 tooling. Cool grey and white contrast throughout the upper, working together with a dark obsidian eyestay and tongue, along with hits of light blue over the eyelets and midsole below. The Cool Grey/Dark Obsidian Air Max 95 No-Sew is now available at select spots such as Oneness.